December 6 was a monumental day in the offices of BloodHorse: Arriving in all of its heft and glory was the 2017 hard copy version of our Stallion Register. It is an exciting day in the annual publishing cycle because it means the project is finished and published, and the industry has a great tool to head into next year’s breeding season. On that same day BloodHorse and Weatherbys launched the Global Stallions app that is now available for Apple and Android phones and tablets. With the app, there is instant access to intel on more than 700 of the leading sires in North America and Europe. The figures, available at the swipe of a thumb, pack quite an impressive punch—pedigrees, sale statistics, and racing statistics. Add the app to the presence of the Stallion Register Online and breeders now have three platforms from which to access the latest and most detailed statistics in the industry. It is hard to fathom in this day what went into producing the Stallion Register in the past without the use of computers—for assembly and for printing. From personal past experience, the “stat” pages were written by hand, with information copied from Daily Racing Form chart books, mare information tallied by hand on “mare cards” in the basement of The Blood-Horse, and data from The Jockey Club and Bloodstock Research Information Systems. At the Gibbs-Inman printing plant in Louisville, Ky., pages were produced on hot-lead type machines with block prints proofed by our research and advertising staff. Today’s pages, while still requiring a lot of hand work, editing, and proofing…and more proofing, are formatted with the push of a button. There have been a lot of statistical enhancements through the years—this year’s switch to black-type rules for example—but what’s interesting is the look of the page of the print version of the Stallion Register hasn’t changed all that much in the last 50 years, with its four-cross pedigree in the upper right-hand corner, the stallion’s race record, progeny records (or stud analysis), sales data, top runners, female family history, and a “sire blurb” at the bottom as to where he stands, for how much, and whom to contact. Picture pages have added four-color to the mix since the pages went to white in the 1990s (they were first light blue, then light green starting in 1985). For more detailed information on the history of the Stallion Register, read Tom Hall’s insightful look in this week’s BloodHorse 100 feature (see page 22). As for more on the app and its functionality, see page 28. As for the app itself, download it—it’s free—and give it a spin. I guarantee you’ll be impressed. As we left the office Dec. 10, in the lobby was a sizable pallet stacked with Stallion Registers ready to be put into the mail. 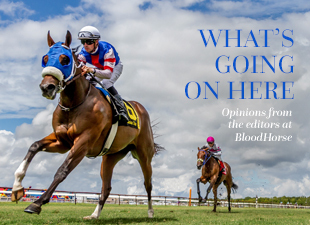 BloodHorse long ago offered annual subscribers an “out clause” if they didn’t want to receive the book—there are a lot of mailboxes it doesn’t fit into and some readers are purely racing fans. Nonetheless, our circulation crew noted more than 10,000 hard copies have been delivered or are in the mail. As for the Stallion Register Online, imagine these year-to-date numbers through Dec. 8: Users—233,381; Sessions—1,022,384; Page views—3,049,356. As more people migrate to their smartphones for accessing information, the Global Stallion app will take all of these numbers to new heights.